Tonsillitis refers to inflammation of the palatine tonsils, most commonly due to infection. Whilst most cases of tonsillitis are harmless and fully resolve, significant complications include peritonsilar abscess and acute otitis media. In this article, we shall look at the pathophysiology, clinical features and management of tonsillitis. The palatine tonsils are located within the oropharynx as part of Waldeyer’s ring – a circle of lymphoid tissue in the pharynx. Tonsillitis is most commonly caused by viral infections. Bacterial causes account for approximately one third of cases (causative organisms include S. Pyogenes, S. Aureus, and M. Catarrhalis). Tonsillitis presents with difficult or painful swallowing, with often pyrexia or halitosis. On examination, the tonsils appear erythematous and swollen with evidence of purulent exudate and lymphadenopathy in bacterial cases (Fig. 1). Figure 1 – Tonsillitis. The tonsils are erythematous and swollen, with evidence of exudate. Important differentials to consider in cases of potential tonsillitis include infectious mononucleosis (EBV), head and neck malignancy, leukaemia, Scarlett fever, or abscess formation. Tonsillitis is a clinical diagnosis; further investigations are only warranted in cases with suspected complications. Ensuring sufficient analgesia (normally achieved with Difflam and regular paracetamol ±NSAIDs) and hydration is the mainstay of treatment. Very few cases require inpatient hospitalisation. If the cause is thought to be bacterial, antibiotics can be prescribed. The antibiotic of choice should be penicillin-based, such as phenoxymethylpenicillin or benzylpenicillin*. *Clinicians should avoid prescribing amoxicillin, as this will cause a maculopapular rash if the underlying pathogen is actually EBV. The main complication from tonsillectomy is secondary bleeding (>24hrs post-op) from infection; this should be treated with IV antibiotics and hydrogen peroxide mouth wash (surgical re-intervention is rarely required). A quinsy is a peritonsillar abscess, a common complication of (often under-treated) bacterial tonsillitis. Patients present with sore throat and difficulty swallowing (similar to tonsillitis). However, additional symptoms of trismus, pyrexia, and halitosis are more common. On examination, a significant peri-tonsilar swelling is seen with a deviated uvula (Fig. 2). Needle aspiration following topical local anaesthetic. Incision and drainage, with further opening via use of Magill forceps. Following drainage, antibiotic cover is also required, typically a penicillin and metronidazole combination regime. Retropharyngeal abscess – forms when infection spreads to the potential space anterior to the prevertebral fascia. 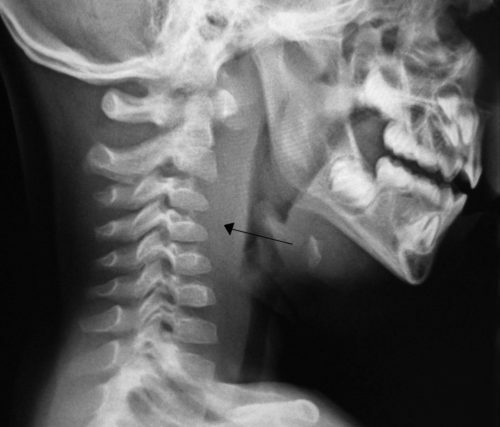 Parapharyngeal abscess – forms when infection spreads to the potential space posterolateral to the nasopharynx. Pharyngeal abscesses may present in a similar manner to peritonsillar abscesses, often with associated reduced neck movement / cervical pain. If a pharyngeal abscess is suspected, a CT scan with IV contrast is the gold-standard investigation, alongside routine bloods and blood cultures (cervical spine radiographs may also show soft tissue inflammation). Any concerns about airway compromise should be addressed as a priority, however most cases will be treated with surgical drainage and IV antibiotics. Which of the following is not a part of the Centor criteria for acute tonsillitis? What antibiotic should be avoided if prescribing antibiotics for tonsillitis? How is secondary bleeding following tonsillectomy treated? What is the gold standard investigation for cases of suspected pharyngeal abscess?